The 2015 MVP Circuit is an event designed to promote disc golf to new players, introduce players to the MVP Disc Sports brand and products, and serve as a gathering for MVP Fans. There will be two rounds of play, one at Young's and one at Kent, singles format, as well as a Putter Olympics and driver showcase. Players will win points in each event. Prizes will be awarded to first place in putter olympics, driver showcase, and singles round. Player with most overall points will win the grand prize and a golden aluminum trophy disc. THIS IS A PRE-RESGISTER ONLY EVENT. $30 Registration fee can be paid online or with me out on the course. Each Circuit Director will be provided with one default prize pack to divide at their discretion, and may purchase additional Circuit-stamped discs for prizes. 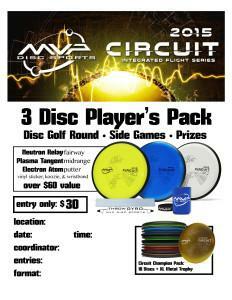 The Circuit Champion Prize Pack includes 10 Circuit-stamped MVP discs and a 15cm diameter, 275g golden aluminum trophy disc. The Driver Showcase will include some events similar to the Putter Olympics. Trumbull County Chain Chasers is responsible for all refunds/cancelations.